Move over, graphene. An atomically thin, two-dimensional, ultrasensitive semiconductor material for biosensing developed by researchers at the University of California Santa Barbara (UCSB) promises to push the boundaries of biosensing technology in many fields, from health care to environmental protection to forensic industries. 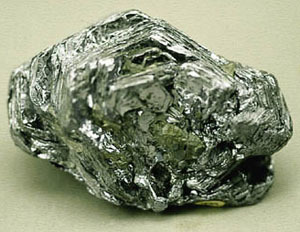 Based on molybdenum disulfide or molybdenite (image), the biosensor material — used commonly as a dry lubricant — surpasses graphene’s already high sensitivity, offers better scalability, and lends itself to high-volume manufacturing. Results of the researchers’ study have been published in the April 22, 2014 issue of ACS Nano., with a correction published in the May 27, 2014 issue of ACS Nano. “This invention has established the foundation for a new generation of ultrasensitive and low-cost biosensors that can eventually allow single-molecule detection — the holy grail of diagnostics and bioengineering research,” said Dr. Samir Mitragotri, co-author and professor of chemical engineering and director of the Center for Bioengineering at UCSB. “Detection and diagnostics are a key area of bioengineering research at UCSB and this study represents an excellent example of UCSB’s multifaceted competencies in this exciting field.” The key, according to UCSB professor of electrical and computer engineering Kaustav Banerjee, who led this research, is molybdenite’s band gap, the characteristic of a material that determines its electrical conductivity. Semiconductor materials have a small but nonzero band gap and can be switched between conductive and insulated states controllably. The larger the band gap, the better the material’s ability to switch states and to insulate leakage current in an insulated state. Accidents as minor as a slip of the knife while chopping onions can turn dangerous for patients with hemophilia because they lack the necessary proteins in their blood to stem the flow from a wound. 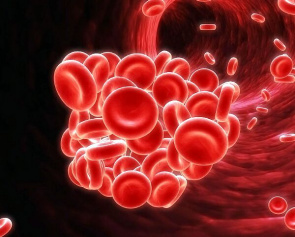 People with severe hemophilia typically receive regular injections of these proteins, called clotting factors, as a treatment for the disease. But up to 30 percent of people with the most common form, hemophilia A, develop antibodies that attack these life-saving proteins, making it difficult to prevent or treat excessive bleeding. Now, researchers from the University of Florida (UF) Health and the University of Pennsylvania have developed a way to thwart production of these antibodies by using plant cells to teach the immune system to tolerate rather than attack the clotting factors. The study was published in the September 4, 2014 issue of Blood. “The only current treatments against (antibody) formation cost $1 million and are risky for patients,” said Henry Daniell, Ph.D., interim chairman of biochemistry at the University of Pennsylvania School of Dental Medicine and a co-author on the study. “Our technique, which uses plant-based capsules, has the potential to be a cost-effective and safe alternative.” The study focused on hemophilia A, which occurs when babies are born with a particular defective gene on the X chromosome. Because girls have two X chromosomes — giving them two shots at having a working version of the gene — the disease typically only affects boys. Worldwide, one in 7,500 male babies is born with this disease. After receiving factor VIII treatments, between 20 and 30 percent of patients develop antibodies against the clotting protein. Instead of allowing the protein to do its job, the immune system responds to this foreign protein as an invader that must be attacked and eliminated. A collaborative team of scientists including biochemist Dr. Peter Chien at the University of Massachusetts, Amherst, has reconstructed how bacteria tightly control their growth and division, a process known as the cell cycle, by specifically destroying key proteins through regulated protein degradation. Regulated protein degradation uses specific enzymes called energy-dependent proteases to selectively destroy certain targets. Because regulated protein degradation is critical for bacterial virulence and invasion, understanding how these proteases function should help to uncover pathways that can be targeted by new antibiotics. All organisms use controlled degradation of specific proteins to alter cellular behavior in response to internal or external cues, says Dr. Chien, an assistant professor of biochemistry and molecular biology. And, a process that has to happen as reliably and stably as cell division also has to be flexible enough to allow the organism to grow and respond to its ever-changing environment. But little has been known about the molecular mechanics of how cells meet these challenges. The current work, done in collaboration with Dr. Kathleen Ryan and colleagues at the University of California, Berkeley, was supported by the NIH's National Institute for General Medical Sciences. Results appeared online on September 2, 2014 in PNAS. Energy-dependent proteases can be thought of as tiny molecular-level machines, says Dr. Chien. By selectively cutting and destroying key proteins at precise time points during cell division, they take charge of when, and at what rate, a cell grows and divides. They are found in all kingdoms of life, but are especially important in bacteria where they help cells overcome stressful conditions such as an attack by antibiotic treatment. Researchers from the University of Liverpool, in collaboration with Public Health England, have investigated new ways to identify drugs that could be used to treat Ebola virus infection. The scientists looked at what proteins inside a cell are critical for the functions of Ebola virus and are hijacked by the virus to help with infection. One of the proteins they have targeted is known as VP24. This protein disrupts signaling in infected human cells and disrupts the body’s immune system and the fight against the virus. Once the team identified these cellular proteins they were able to find out whether any drugs were already in existence that could block the function of the particular protein. One such drug identified was ouabain, which can be used in the treatment of heart disease. Administering this drug reduced Ebola virus replication in treated cells. The study was led by Professor Julian Hiscox from the University’s Institute of Infection and Global Health and Professor Roger Hewson at Public Health England (PHE). Disrupting cellular proteins important for viruses also has the potential to tackle the problem of resistance to medication. Professor Hiscox said: “This study shows how existing therapeutics can be identified and potentially repurposed for anti-viral therapy. The technique of using existing and tested drugs for a different purpose can save considerable time and ultimately, lives.” Disrupting cellular proteins important for viruses also has the potential to tackle the problem of resistance to medication. Because the cellular proteins are effectively evolutionarily static, the virus won’t be able to adapt to defeat it – as is increasingly the case with treatment by anti-virals used against viral proteins such as is seen with influenza virus and HIV infection. The study, which also involved Dr.
RNA-sequencing allows measuring the gene expression of humans or other organisms. The method has recently become very popular in bioscience and medical research, and it is being adopted to clinical applications. Compared to previous methods, RNA-sequencing enables the study of alternative gene isoforms or transcripts, which are formed, for example, through the process of alternative splicing. The analysis of the large amount of data produced by RNA-sequencing requires many advanced computational methods. Analysis of transcript level data is especially demanding and the differences between alternative methods can be large. In the recent assessment (“A comprehensive assessment of RNA-seq accuracy, reproducibility and information content by the Sequencing Quality Control Consortium,” published online in Nature Biotechnology on August 24, 2014), the BitSeq method developed by the University of Helsinki and the University of Manchester researchers produced clearly the most reliable results in this task. In one subtask, BitSeq could produce equally accurate results using only half the data needed by a very popular alternative method. The BitSeq method (http://bioinformatics.oxfordjournals.org/content/28/13/1721) is based on probabilistic modelling that allows comparing different possible origins for observed sequences that cannot be identified uniquely. This allows computing probability distributions over the expression levels of each transcript of every gene in a way that captures the uncertainty and possible sources of error in the measurements. Accounting for this uncertainty through probabilities is essential for the accuracy of the method. When factoring in what is now known about breast cancer biology and heterogeneity, breast-conserving therapy (BCT) may offer a greater survival benefit over mastectomy to women with early-stage, hormone-receptor-positive disease, according to research from The University of Texas MD Anderson Cancer Center. The study findings defy the conventional belief that the two treatment interventions offer equal survival, and highlight the need to revisit some standards of breast cancer practice in the modern era. The research was presented on September 4, 2014 at the Breast Cancer Symposium 2014 (September 4-6) in San Francisco, California, by Catherine Parker, M.D., formerly a fellow at MD Anderson, and now at the University of Alabama-Birmingham. In the 1980s, both US-based and international randomized clinical studies found that BCT and mastectomy offered women with early-stage breast cancer equal survival benefit. However, those findings come from a period in time when very little was understood about breast cancer biology, explains Isabelle Bedrosian, M.D., associate professor, surgical oncology at MD Anderson. "Forty years ago, very little was known about breast cancer disease biology – such as subtypes, differences in radio-sensitivities, radio-resistances, local recurrence, and in metastatic potential," explains Dr. Bedrosian, the study's senior author. "Since then, there's been a whole body of biology that's been learned – none of which has been incorporated into patient survival outcomes for women undergoing BCT or a mastectomy. We thought it was important to visit the issue of BCT versus mastectomy by tumor biology," Dr. Bedrosian stated. The researchers hypothesized that they would find that patients' surgical choice would matter and impact survival with tumor biology considered. Echolocating bats have historically been classified into two groups: 'loud' aerial hawkers who catch flying insects on the wing and 'whispering' gleaners that pick up prey from the ground. While some bat species can forage in multiple ways, others have limited flexibility in the amplitude of their echolocation calls. Dr. Talya Hackett from the University of Bristol (UK) and colleagues studied the desert long-eared bat (Otonycteris hemprichii) (image), said to be a passive 'whispering' gleaner that picks up ground-dwelling invertebrates, such as scorpions, from the desert floor. Using an acoustic tracking system, the researchers recorded the bats flying at four different foraging and drinking sites in the Arava and Judean Deserts in Israel. They then compared the bats' flight height, flight speed, call duration, pulse interval, and source levels with those of other gleaning bats. The results were reported in the September 1, 2014 issue of the Journal of Experimental Biology. Differences were found in all these variables, with the most striking being the source levels: bats were recorded calling at an average of 119 decibels, akin to a 747 jet on take-off, when around 75, akin to a car engine, is more usual when gleaning (though these sounds occur at a high frequency, beyond the range of human hearing). Analysis of the bats' feces also indicated that their diet included prey species capable of flight, such as flies, moths, and beetles. This suggests that the bats switched from passive gleaning to capturing airborne insects (aerial hawking). Dr. Hackett said: "Although whispering bats have been known to opportunistically catch insects on the wing, this doesn't appear to be the case here.